Treatment demand for medicines has remained constant over the past 5 years. Largest group requesting treatment has problems with the use of benzodiazepines. Compared with other substances, a large share of the people requesting treatment for medicine use problems is female. The number of people turning to addiction care with medicine use related problems has increased to almost 900 between 2006 and 2010. Since 2010, treatment demand continues to fluctuate around 850 people. 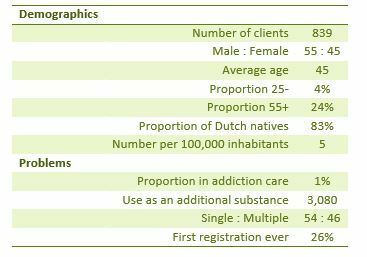 This mainly involves problems with benzodiazepines, which are among the most widely used medicines in the Netherlands. The average age is 45 years and the percentage of women is high compared to other problems. LADIS is een gegevensverzameling van Stichting IVZ. Voor meer informatie over LADIS kunt u contact opnemen met Stichting IVZ.